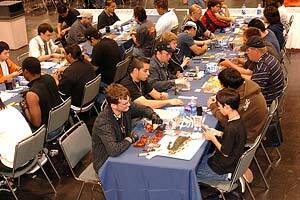 Upper Deck Business to Business - How do I become a Tournament Organizer? How do I become a Tournament Organizer? Once you become an official Upper Deck Entertainment Tournament Organizer, you will be able to run your own tournaments and make your store a destination spot for customers. If you are unfamiliar with TCGs, we recommend requesting a demo through our Demo Team program. Through this program, you and your customers will be able to set up a specific date to learn our games. Sanctioned UDE tournaments require a certified Tournament Organizer to run the tournament. This individual does not have to be you. To run official UDE tournaments you need to be at least 18 years old, have a UDE membership number and password, and pass the Tournament Organization Certification Test which is available at www.ude.com/op. To find the test, just click on the "Certifications" link located on the left side of the page. The name of the test is "Tournament Organization." The policy document that contains the answers to this test can be found in the "Policy Documents" section (just under "Certifications") on www.ude.com/op. The name of that policy document is "UDE Official Tournament Policy." This test is open book, so you can have the test open in one window and the document open in another. The test is timed, so be sure to submit your test before the 30 minute time limit expires. If you attempt to submit your test after the 30 minutes, your test will not be submitted and you will be taken back to the login screen. Once you pass the test, you can now sanction official UDE tournaments. You will receive an email instructing you to email to@upperdeck.com so that we can send out a batch of UDE Membership Registration Cards to you (be sure to include your name, UDE number*, and mailing address along with your request). These cards are given to players that do not have a UDE number and wish to participate in your sanctioned tournaments. The software needed to sanction (this will place your tournament on the tournament locater), run, and report the tournament can be found at www.ude.com/op. Just click on the "MANTIS" link on the left-hand side. When you download the software onto your computer, please click on the "Documents" tab to find the "MANTIS Operational Instructions." You will also need a certified judge for your event. For example, if you are running a sanctioned WoW TCG tournament, you will need a certified WoW TCG level 1 judge. The judge tests can be found on the same page as the "Tournament Organization" test.